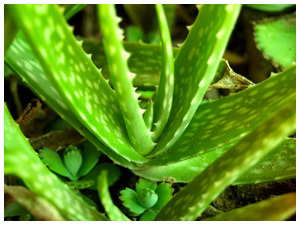 The pulp of Aloe vera has excellent healing properties. Its often used in skin lotions due to its moisturizing and anti-aging properties. When used as an internal medicine, it regulates the blood circulation, and helps in the functioning of liver and spleen. This plant is also known as “Plant of immortality” and “medicine plant”. There are more than 500 varieties of alow growing in the different climates worldwide. Researches shows that the clear get has an immmense power to heal wounds.